Chiknlips45 graciously consented to my email asking if I could tag along on his next trip out to search for this station. He'd already done his homework (yes, the math we learned in high school geometry class paid off out here today!) so all we needed to do was measure distance at the correct angle from the already-found RM3 and the other markers were brought to the light of day in methodical (and muddy) order. His log provides excellent detail about our search. I was most impressed at this location by the amount of sediment that had been deposited on top of the marks since the 1964 recovery log (which notes the station and RM2 were flush with the surface), and by the erosion of 59 feet of the bank here since 1964. Had a great time out here with Chiknlips45 today, who is quite methodically finding the benchmarks scattered all across the NE corner of Anchorage! 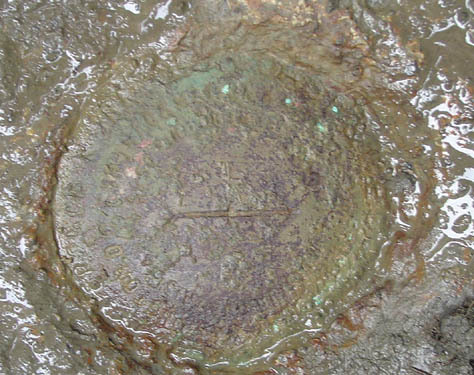 Battered and with illegible stamping, the disk was brought to light from its location 15" below current grade. All that was visible on this mark was its arrow pointing faithfully towards the tri-mark. This one was 15" below grade too. After our success digging out the main station and RM2, chiknlips45 asked if I was game to search for RM1 (listed on the 1964 NGS recovery log as 'not recovered'). With his excellent preparation I felt we had a great shot at finding the missing Reference Mark. All we found was the concrete setting for the mark, complete with the wood form around the concrete. The top of the monument was destroyed, and the mortar holding the gravel together has been rendered ineffective over time. This reference mark did its assigned job well - pointing us to the station that lay hidden under 15" of sedimentation since its last recovery in 1985 (23 years ago). 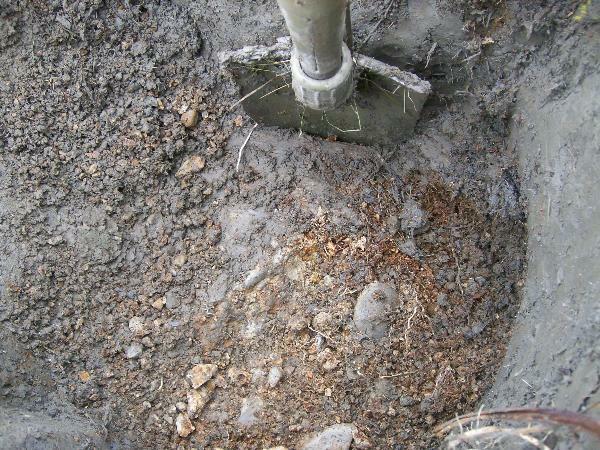 chiknlips45 cleans the face of RM2, found 15" below the vegetated surface of the flats. The yellow tape stretches back to the main mark, while the white tape (at right) leads to the barely visible RM3. It was noon, the frost had melted, and the snowy mountains were drifting in and out of the clouds... great day to be in the field! Looking across the mark on a bearing of 102 degrees to UV4378 - East Twin Peak - 12.7km distant. It's the left-most of the two peaks visible on the horizon - and used as a reference object when this station (UV4396) was monumented in 1922. 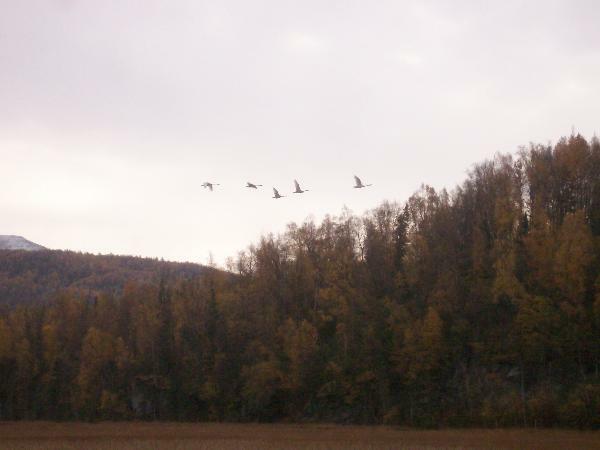 In the course of the morning's work along the shoreline of Knik Arm, on the upper NE reach of the Pacific Ocean's Cook Inlet, we were fortunate enough to observe at close hand many swans (including this 5-bird overflight). Waves of migratory waterfowl were in motion southbound. We were observed close-up by 3 eagles and a falcon as well. Found on the second attempt with a lot of help from NorthWes. RM3 is still protruding well above ground level and was the obvious starting spot. RM3 resides at N 61° 28.111, W 149°22.635 with 7 feet of accuracy. RM3 is now 71 feet south of the inlet bluff. 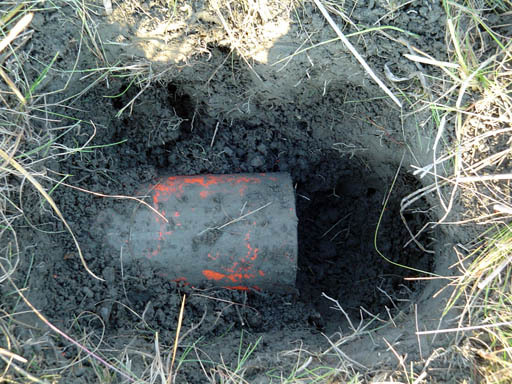 On my first attempt, the 7 foot orange post was recovered 4 inches under the ground surface by following the RM3 arrow and datasheet distance info, so we knew it would be a digging operation. We ran the tape from RM3 to establish the correct distance arc. Once done, NorthWes noticed a dip in the ground level and had a hunch where the station was located and started digging. 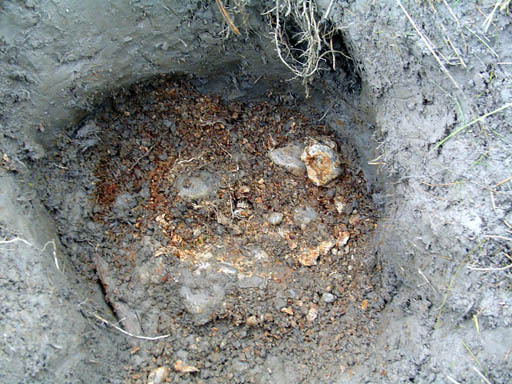 After about 10 inches of soil was removed, the area was probed and a solid object was hit. After removing another 5 inches of soil, the main station was confirmed found. The main station now resides only 20 feet south of the inlet bluff due to erosion in the area. RM3's alignment arrow appears to be off slightly to the NE by about 1 foot at the main station's distance. Tapes were ran from the main station and RM3 to show RM2's intercept and after another 15 inches of soil was removed, RM2 was found at N 61°28.112, W 149°22.659 with 7 ft of accuracy. Again the intercept was performed for the lost RM1 disk. 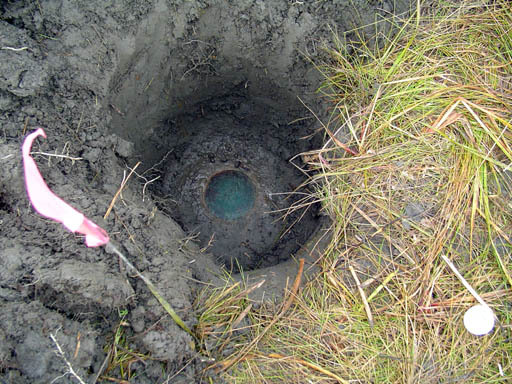 The hole was dug and a cement monument was recoverd 17 inches below ground level at N 61° 28.119, W 149° 22.621 with 5.9 feet of accuracy but the disk was gone. Had the distances from RM3 to RM1 and RM2 not been calculated before venturing out to the site, we would not have recoved RM2 or RM1's monument. The distance from RM3 to RM2 is 71 Feet, 9 inches. The distance from RM3 to to RM1 monument is 50 feet, 1/2 inch. Being prepared and doing your homework beforehand is a wonderful thing. 15" deep hole dug to recover Peters E Base station. Post found approx 2 ft NE from main station under 4 inches of soil. RM2 dig site with yellow tape going to the main station, white tape going to RM3. Close up shot of RM2 disk. 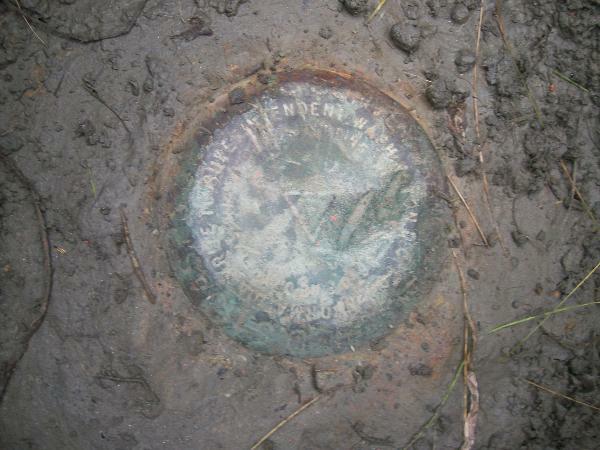 DESCRIBED BY COAST AND GEODETIC SURVEY 1922 (LCD) PETERS EAST BASE IS LOCATED ABOUT 1-1/2 MILES NORTHWEST OF EKLUTNA RAILROAD STATION OF THE ALASKA RAILROAD. IT IS ABOUT 1 MILE EAST EKLUTNA CREEK, ABOUT 3/4 MILE WEST OF HUNTS BUTTE, AND ABOUT 300 FEET WEST OF AND 1/4 MILE NORTH OF A SMALL WOODED BUTTE. 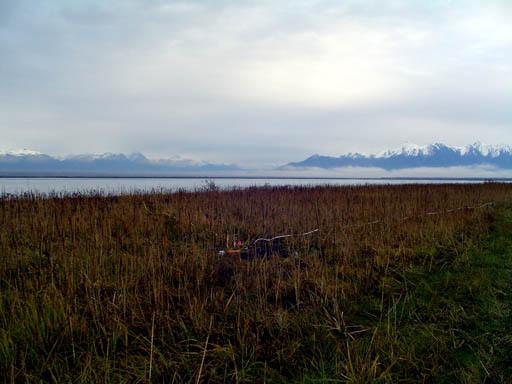 IT WAS PLACED ABOUT 50 METERS BACK FROM THE SOUTH BANK OF KNIK ARM IN FLAT GRASSY SEMI-MARSHY GROUND. STANDARD SURFACE AND SUBSURFACE MARKS SET IN CONCRETE. TWO STANDARD REFERENCE MARKS SET IN LIKE MANNER. 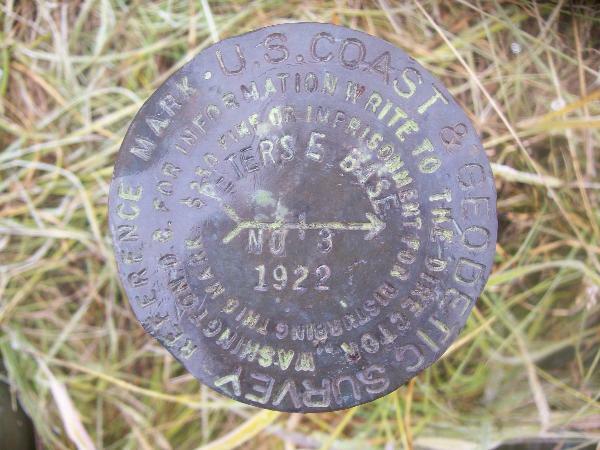 RECOVERY NOTE BY COAST AND GEODETIC SURVEY 1942 (HJS) STATION AND REFERENCE MARKS RECOVERED IN GOOD CONDITION. STATION MARK IS STAMPED PETERS E BASE 1922. BOTH REFERENCE MARKS STAMPED PETERS E BASE 1922. STATION IS LOCATED ALONG THE S BANK OF THE UPPER OR E PORTION OF KNIK ARM, IN FLAT GRASSY SEMI-MARSHY GROUND ABOUT 1/2 MILE N OF THE EKLUTNA RAILROAD STATION ON THE ALASKA RAILROAD, ABOUT 1-1/4 MILES E OF EKLUTNA CREEK, AND ABOUT 1/4 MILE NW OF A SMALL WOODED BUTTE. REACHED BY DRIVING TRUCK OR CAR N FROM THE RAILROAD CROSSING AT THE EKLUTNA INDIAN SCHOOL THROUGH THE BARNYARD AND THENCE ON A TRACK ROAD TO THE END OF THE ROAD AT THE S BANK OF KNIK ARM ABOUT 3/4 MILE. PACK E ALONG THE BANK FOR ABOUT 1/4 MILE TO STATION ABOUT 100 FEET INSHORE FROM THE BANK. RECOVERY NOTE BY US GEOLOGICAL SURVEY 1950 (JMA) STATION FOUND AS DESCRIBED. STATION MARK--STANDARD USC AND GS DISK SET IN THE TOP OF A SQUARE CONCRETE POST. 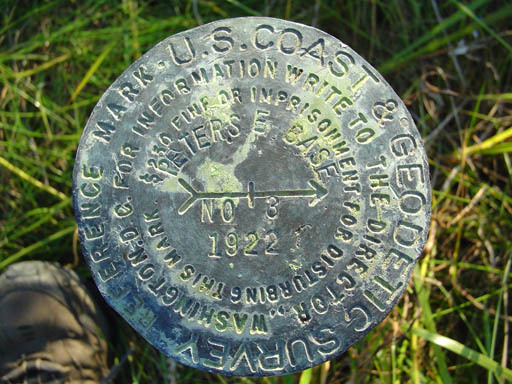 RECOVERY NOTE BY COAST AND GEODETIC SURVEY 1964 (LGB) THE STATION MARK AND REFERENCE MARK 2 WERE RECOVERED IN FAIR CONDITION. 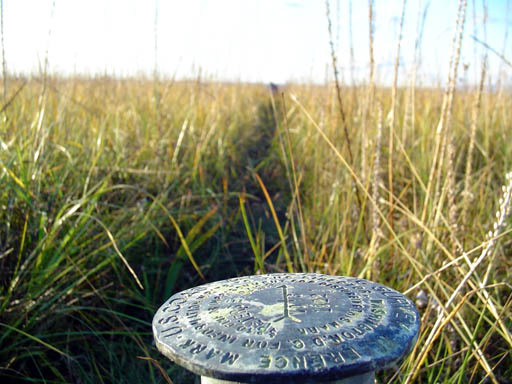 DUE TO THE MARSHY AREA AROUND THE MARKS THEY COULD NOT BE REINFORCED. REFERENCE MARK 1 WAS NOT RECOVERED SO REFERENCE MARK 3 WAS SET. 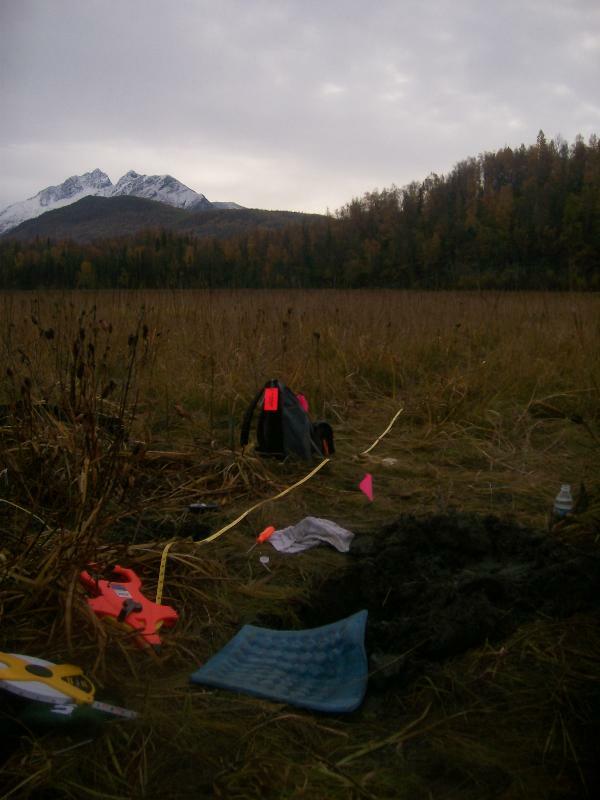 THE STATION IS LOCATED IN A FLAT MARSHY AREA ABOUT 1-1/2 MILES NORTHWEST OF THE ALASKA RAILROAD STATION IN EKLUTNA, 1 MILE EAST OF EKLUTNA CREEK, 1/4 MILE NORTH-NORTHWEST OF A SMALL WOODED BUTTE AND NEAR THE SHORE LINE OF KNIK ARM. TO REACH THE STATION FROM THE POST OFFICE IN EAGLE RIVER, GO NORTHERLY ON STATE HIGHWAY 1 FOR 11.4 MILES TO THE THUNDER BIRD CAMP GROUNDS ON THE RIGHT AND A CONCRETE BRIDGE OVER THE EKLUTNA RIVER STRAIGHT AHEAD. CONTINUE NORTHERLY ON STATE HIGHWAY 1 FOR 0.25 MILE TO A SIDE ROAD LEFT. TURN LEFT, GO NORTHWEST ON A GRAVELED ROAD FOR 0.4 MILE TO A GUARD SHACK ON THE RIGHT. ( THIS IS THE ENTRANCE TO A MILITARY INSTALLATION.) CONTINUE STRAIGHT AHEAD ON THE MAIN GRAVELED ROAD FOR 0.15 MILE TO A RAILROAD CROSSING AND FORK JUST AFTER CROSSING THE RAILROAD TRACKS. TAKE THE RIGHT FORK, GO NORTHERLY ON THE MAIN GRAVELED ROAD FOR 0.1 MILE TO A FORK. TAKE THE RIGHT FORK, GO NORTHERLY ON A TRACK ROAD THROUGH WOODS FOR 0.6 MILE TO AN OPEN AREA NEAR THE SHORE LINE OF KNIK ARM AND THE END OF TRUCK TRAVEL. 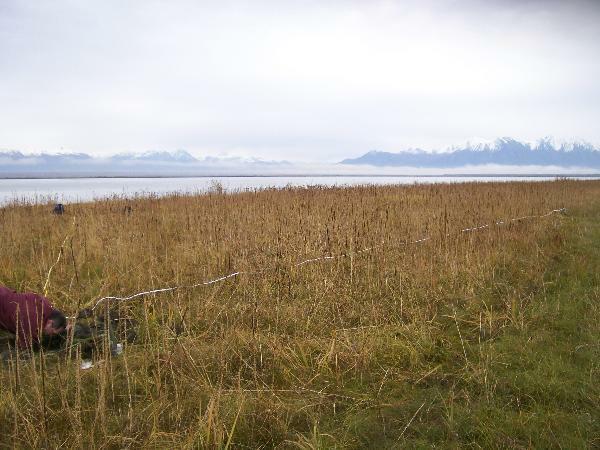 HIKE EAST ALONG THE SHORE LINE FOR ABOUT 1/4 MILE TO THE STATION LOCATED IN THE FLAT MARSHY AREA NEAR THE SHORE LINE OF KNIK ARM. 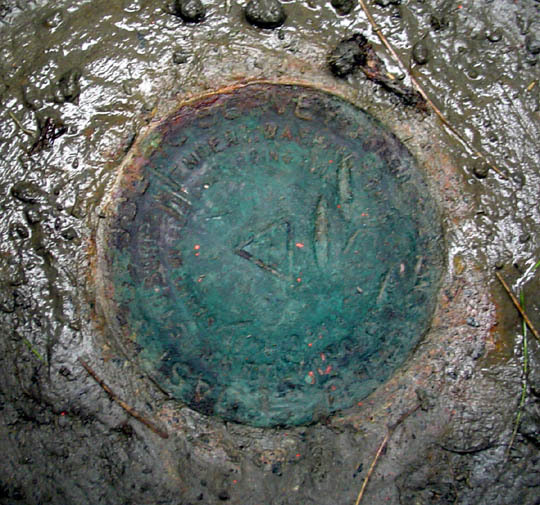 THE STATION MARK IS A STANDARD DISK, STAMPED PETERS E. BASE 1922, SET IN THE TOP OF 10-INCH CYLINDRICAL CONCRETE MONUMENT WHICH IS FLUSH WITH THE GROUND SURFACE. IT IS 79 FEET SOUTH OF THE SHORE LINE OF KNIK ARM. 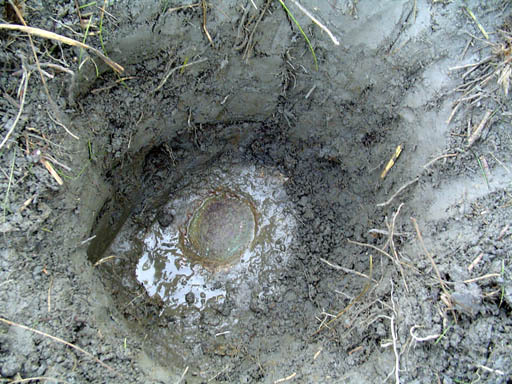 REFERENCE MARK 2 IS A STANDARD DISK, UNSTAMPED, SET IN THE TOP OF A 10-INCH CYLINDRICAL CONCRETE MONUMENT WHICH IS FLUSH WITH THE GROUND SURFACE. IT IS 139 FEET SOUTH OF THE SHORE LINE OF KNIK ARM. REFERENCE MARK 3 IS A STANDARD DISK, STAMPED PETERS E. BASE NO 3 1922, BRAZED TO THE TOP OF A 2-INCH GALVANIZED PIPE WHICH IS DRIVEN IN THE GROUND AND REINFORCED WITH CONCRETE BELOW GROUND LEVEL AND IT PROJECTS 30 INCHES. IT IS 108 FEET SOUTH OF THE SHORE LINE OF KNIK ARM. RECOVERY NOTE BY NATIONAL GEODETIC SURVEY 1973 (RBM) THE STATION WAS RECOVERED IN GOOD CONDITION. THE OLD, WOODEN OBSERVING STAND IS STILL OVER THE STATION. RECOVERY NOTE BY R + M CONSULTANTS INCORPORATED 1985 (RPB) STATION RECOVERED IN FAIR CONDITION AS DESCRIBED IN LAST DESCRIPTION. STATION REACHED BY HELICOPTER WHICH CAN LAND AT STATION. STATION DISK IS SCARRED AND PARTIALY ILLEGIBLE. REFERENCE MARKS WERE NOT RECOVERED -- CONDITION UNKNOWN. THE OLD WOOD OBSERVING STAND WAS FOUND DESTROYED LYING BY THE STATION. 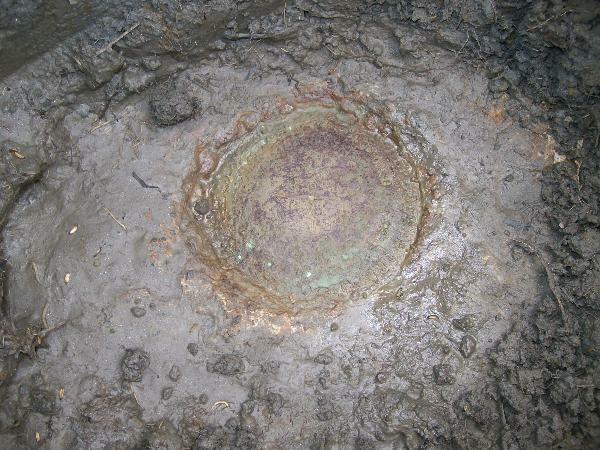 A 7 FOOT TALL FOUR INCH DIAMETER ORANGE SITE POST WAS CENTERED AND GUYED OVER MONUMENT DISK.